Most of the users highly admired the comfortable feel of the Fierce Core. Some noted the lightweight construction of the shoe. Based on some reviews, the shoe is very breathable because of the mesh upper material and textile linings. A significant number of users liked the shoe’s modern look and style. The shoe’s internal flatlock stitching reduces friction. The Puma Fierce Core is affordable. It can double as a training shoe. A few felt that the shoe looks bulky on their feet. Designed for a fiercer move, the Puma Fierce Core offers comfort, breathability, and impressive technical details along its modern style. Puma considered this training shoe as a game-changer as it allows users to do sports to the extreme. The slip-on bootie construction, and the pull tabs tongue and heel are other things that made onlookers impressed. Despite the appealing looks and sports-capable features, the shoe hardly breaks the bank for anyone who wishes to own a pair. Inspired by dance movements and designed for aggressive training, the Puma Fierce Core bridges the gap between style and athletics. This training sneaker is already available in the market since April 2016. The women’s version of the sneaker was endorsed by American reality TV personality, Kylie Jenner. The modern design of the sneaker looks similar to Rihanna’s Fenty trainers. Both have bootie construction and the upper is made with Ariaprene, a material that delivers breathability and enhanced comfort. In just a short span after the Fierce Line was released, it was already a very solid option in the arsenal of many. Puma is not just limiting the production of the Fierce Line to a few shoes. Among the several choices that the sneaker community have are the Puma Fierce Knit, Puma Fierce Quilted, Puma Fierce Swan, Puma Fierce Strap, and the Puma Fierce EVOknit. The slip-on bootie design and the metallic detailing bring this training shoe to the next level. The materials and technologies were strategically combined, allowing users to move aggressively. The Fierce Core brings out the fiercer side of modern fashion when paired with skinny jeans, shorts and denim skirts. The sophisticated style is not only tailored for urbane or chic occasions, but also for those who wish to look stylish during training. For those who are always on the go, this is a style that can really do more than turn heads. The Fierce Core runs true to size. It gives comfortable fit to users with medium to slightly wide foot measurements. Sizes available are 7 to 13 for men’s and 5.5 to 9 for women’s. As the shoe is built for the active lifestyle like training, the shoe has exceptional hold and support for those who wish to dabble in some training while wearing this shoe. Almost the entire upper of the Fierce Core is amazingly eye-catching. It starts with the soft tongue that extends farther up towards the leg. This tongue is fitted with a huge loop for quick and convenient pulling on or off. Puma matches this loop in the tongue with another in the heel to complete this very handy element of the shoe. 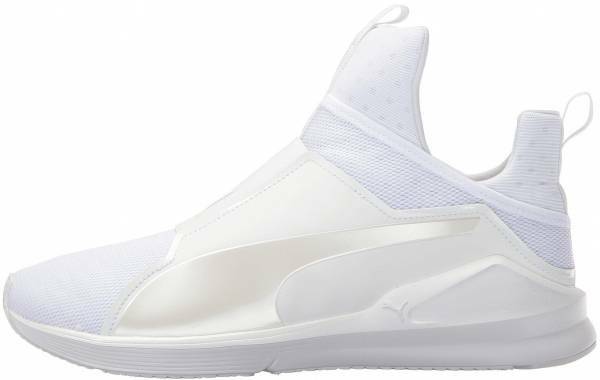 The midfoot overlays that cover the upper feature the very popular Puma logos of the Jumping Cat and Formstrip for a thoroughly distinct and riveting design. This design is quite ingenious as it not only gives the user a very appealing look, but also a very useful part of the shoe, particularly for those who live an active life. Puma’s campaign that features Kylie Jenner as a runner gained negative feedback from the running community. Those who take running very seriously found the campaign offensive because she is not a professional track and field star. The pull tabs at the heel and tongue are designed for easy on and off wear. Puma Fierce Core has internal flatlock stitching that gives added comfort and it also reduces friction. The sneaker has a very classy Jumping Cat logo on its lateral side. The overlays that are stylishly detailed in the upper combine to form almost a midfoot cage that is both aesthetically pleasing and performance-inducing.